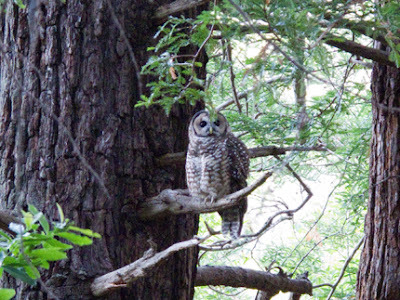 We have a Spotted Owl living in the canyon next to our house. I hear it in the evening and early morning when it is still dark. The other day it spent some time out in the open daylight. For a bird that is known to be "shy" and nocturnal, it seemed quite curious on this day. The Spotted Owl is often split into three sub-species. While the Northern Spotted Owl and Mexican Spotted Owl are both listed and 'theatended' on the Endangered Species List, the California Spotted Owl is not. It is, however, of considerable interest as it is one measure of a healthy ecosystem. Their preferred habitat appears to be a multilayered forest with some old growth and a dense canopy. Most of all, each time I hear the call of 'our' local Spotted Owl something deep inside me stirs... a soft smile and easy breath comes — I am remind of the wildness I am surrounded by and feel a bit more alive. Here is a link where you can listen to the call of the Spotted Owl.